The Toyota Auris was Europe's No. 1 hybrid last year. Sales of hybrids and plug-in hybrids in Europe will triple to more than 750,000 in the next three years, analysts at LMC Automotive predict, as automakers scramble to reach tougher CO2 targets that start to take effect in 2020. Demand for the alternative powertrains rose 22 percent to about 280,000 last year, according to LMC figures, helped by rising acceptance of the technology and generous government incentives. Plug-in hybrids led the way with a sales rise of 163 percent to 96,451 last year, according to figures from market researcher JATO Dynamics, which attributed part of the increase to expansion of the sector. Despite the intensifying competition the Mitsubishi Outlander remained Europe's No. 1 plug-in hybrid with sales of 31,214 units last year, up 57 percent on 2014. The Volkswagen Golf GTE jumped to No. 2 in Europe during its first full year of sales followed by the closely related Audi A3 e-tron. The VW Group models both use the automaker's MQB architecture. The German automaker also sells the VW Passat GTE midsize sedan, which finished 2015 at No. 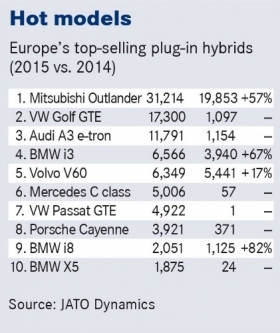 7 on the list of Europe's top-selling plug-in hybrids. VW may be adding another model to the list of leaders as it showed a concept for a GTE version of its new Tiguan compact SUV at the Detroit auto show in January. The Tiguan is a direct rival to the Outlander. BMW also is emerging as a strong player in the plug-in hybrid segment. The i8 supercar finished last year at No. 9 with sales of 2,051, just ahead of the plug-in version of BMW's X5 large SUV. The company will add to its portfolio with the 330e, which is the plug-in hybrid version of the new 3 series midsize model line. In addition, BMW's lineup includes the i3, which is sold either with a range-extending engine or as a full-electric model. The i3 with the range extender outsold the battery-powered variant 6,566 to 5,481 in 2015. LMC sees no future growth for variants with range-extending engines. Sales of plug-in hybrids, which can drive about 50km on electric power alone, are strongest in those countries that offer the biggest incentives. Europe's largest plug-in hybrid market -- and the third largest in the world, according to JATO -- is the Netherlands, which offers tax breaks to company car drivers that can save them up to 7,000 euros a year. Last year 37,048 plug-in hybrids were sold in the Netherlands, but this year demand in the market is expected to cool because the government is raising taxes on the low-CO2 models. Despite the change, LMC predicts continued growth for plug-in hybrids across Europe, with demand reaching almost 250,000 by 2018. The country with the strongest demand for gasoline-powered hybrids (both gasoline-electric full hybrids and plug-in hybrids) was the UK, where both business customers and private buyers are eligible for government money toward the purchase as well as tax breaks. 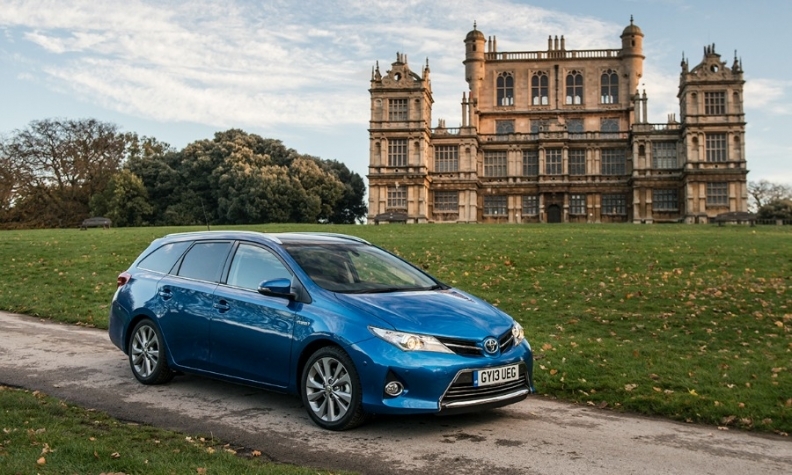 Those incentives helped increase hybrid sales in the UK by 40 percent to 62,871 last year. 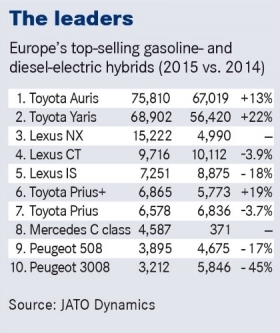 Among Europe's top 10 countries for hybrid sales, fourth-ranked Germany and ninth-ranked Belgium recorded the weakest sales growth last year, with each up just 10 percent, according to JATO. Europe's No. 1 market for hybrids is also where Toyota builds the gasoline-electric Auris. Europe's most popular hybrid, which is made in Burnaston, England, accounted for 74,415 sales last year, up 12 percent on 2014. Toyota's mastery of the technology is evident in Europe’s top 10 list, which last year included eight models from either the Japanese automaker or its premium sister brand, Lexus. Toyota and Lexus sold a record 209,000 hybrids in Europe (including Russia and Turkey) in 2015. That was just under a quarter of all of the brands' combined sales in the region. Toyota Europe CEO Johan van Zyl said in a statement that the sales "demonstrated that European consumers look beyond gas price fluctuations to the benefits of driving a hybrid." Along with the Auris, Prius and Yaris, which is Europe's No. 2-selling gasoline-electric hybrid, Toyota has added a hybrid version of the RAV4 compact SUV and LMC predicts that the automaker will sell a hybrid version of its forthcoming subcompact SUV. Hyundai will challenge Toyota's dominance of Europe's hybrid market starting this year with the Ioniq, which made its debut at the Geneva auto show this month. The car is aimed at the Prius. But while Toyota remains committed to hybrids in Europe and Hyundai is joining the sector Al Bedwell, powertrain analyst for LMC, thinks the segment is nearing its peak "We don’t see a huge growth potential in the midterm, especially if fuel prices stay low," Bedwell said. Some rivals already are taking action as PSA/Peugeot-Citroen will cut its diesel hybrid program in favor of gasoline hybrids. 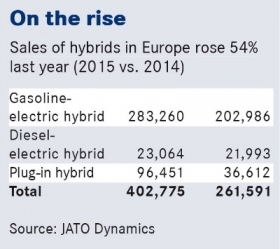 Last year diesel-hybrid sales in France, Europe's largest market for the technology, fell 40 percent according to JATO figures. LMC predicts that mild and micro hybrids will benefit from the shift. Compared with full hybrids, mild and micro hybrids use smaller batteries mated to less powerful electric motors. One forthcoming mild hybrid is the so-called Hybrid Assist version of the Renault Megane diesel. Renault says the variant will be launched in 2017 with a targeted CO2 figure of 76 grams per kilometer, well under the 95g/km that automakers will need to reach starting in 2020, down from about 123g/km in 2014, according to data from the European Environment Agency. Renault says the car will capture energy during braking, then boost acceleration only under certain conditions, for example at low speeds, to increase economy. LMC predicts that the arrival of 48-volt electrical systems will dramatically expand the market for hybrids starting next year, causing sales of mild and micro hybrids to reach 275,000 by 2018, up from just 11,468 last year. Austrian engine consultant AVL has predicted that by 2020 nearly every mild hybrid sold will have a 48-volt system. "It offers a good improvement in CO2 for considerably less cost than a full hybrid," LMC’s Bedwell said. He predicts that automakers will primarily sell mild hybrids mated to gasoline engines because of the high expense of reducing emissions in diesels.